I’m putting this one up for two reasons. First, it is one of the most interesing, complex, and spectacular flavors I have ever experienced, and second, because I made the dish for my wife once, and the results were, well, gratifying. And anything that makes my wife weak in the knees is worth a lot of my time. The chocolate in this classic Mexican dish makes for a very rich, somewhat mysterious and delicious sauce. 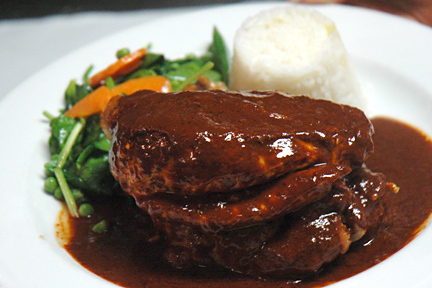 I first tasted mole in a wonderful little restaurant in Washington, D.C., where it was prepared by a superb cook who was trained in Mexico, and whose dark sauce was the consistency of heavy cream. I have been disappointed since by the watery versions served in many American Mexican restaurants, but have found that the sauce is not difficult to master at home. The size of the ingredient list looks daunting, but it is really not nearly as difficult as it appears, and is WELL worth the time invested. This one will dazzle your guests. Guaranteed. In a small skillet, heat 1 Tbsp of the oil over moderate heat and in it cook the sunflower kernels, sesame seeds, cumin seeds, aniseeds, and almonds, stirring constantly until the sesame seeds and almonds are golden, 2 or 3 minutes. Purée the mixture in a food processor. Add to the processor the raisins, oregano, cinnamon, cloves, coriander, chili powder, tomatoes, onions, garlic, salt, pepper, the tortilla, and 1/2 cup of the stock and purée until smooth. Transfer the purée to a saucepan. Stir in the remaining 2-1/2 cups stock, bring the sauce to a simmer, and add the chocolate. Cook the sauce at a gentle simmer, stirring occasionally, to melt the chocolate. While the sauce is simmering, rinse the chicken quickly in cold water and dry with paper towels. In a large casserole, heat the remaining 3 Tbsp oil over moderately high heat and in it sauté the chicken in batches until each piece is golden brown on all sides. Set the pieces aside on a plate as done. Put the chicken and any accumulated juices in a flameproof casserole, placing the dark meat on the bottom. Pour the sauce over the chicken. Simmer, covered, until the chicken is tender, about 30 minutes. Place the chicken on a warm serving platter. Pour the sauce over the chicken, garnish with the chopped fresh coriander, and serve. I like to serve this dish with brown rice prepared with just a light touch of coriander and mild green chiles.